Grilled chicken breasts are naturally low in fat but that also means that they can dry out to leathery slabs if you're not careful. Fear not, though! This recipe for barbecue chicken breasts is practically foolproof. 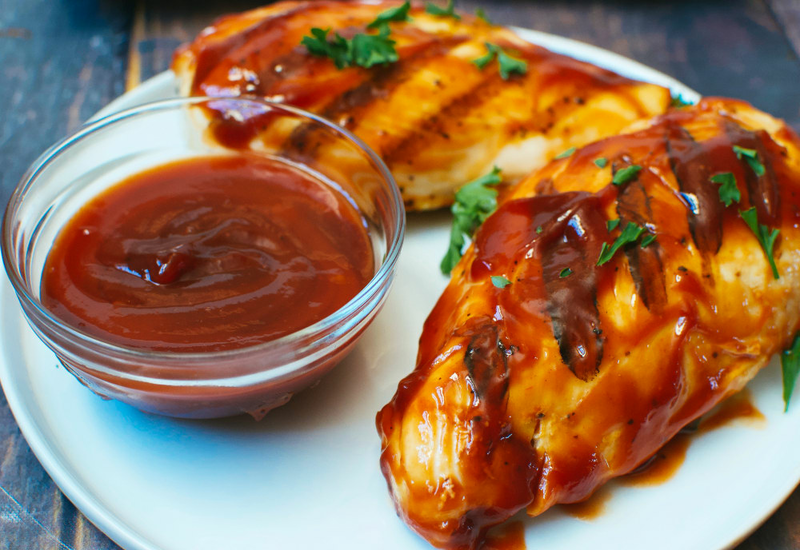 The key is the homemade barbecue sauce that does double duty as a marinade and basting sauce. The quick marinating time makes it perfect for busy weeknights. The dish is packed with delicious, smoky flavor so you'll want to serve it at your cookouts, too. You grill the chicken on aluminum foil on top of the grates, so cleaning up afterward is super simple, as well. If you have any leftover chicken, you have so many options for turning it into another meal. Chop up the chicken to serve in a Cobb salad. Slice it and pile onto potato rolls with cole slaw for sandwiches. Or mound it into tacos with diced onion and cilantro. Per Serving: 303 calories; 5g fat; 24.9g carbohydrates; 39g protein; 102mg cholesterol; 164mg sodium. I recently made this recipe, and it was really good. It's simple, with a traditional homemade sauce. You can use breasts or thighs for this recipe. Both are delicious! If you're looking for a go-to BBQ chicken dish, this is it. The best part of this recipe was the sauce, because of how quick and easy it is to make. I marinated the chicken overnight before grilling and it was really delicious. It definitely helps to baste with extra sauce as you go, to keep the chicken from drying out. The homemade bbq sauce is perfect. The apple cider vinegar and molasses is a must for this recipe. We use the chicken and sauce to make sandwiches. So delicious! Didn't have mustard powder so I used 1 tablespoon regular mustard for this sauce. I ended up shredding the chicken breast and tossing it in the reserved sauce. It was really good. This recipe was OK. I rushed through making the sauce and substituted molasses for maple syrup. I also didn't use ground mustard because I didn't have any. My kids really liked it, but I think I prefer store bought sauce because it's quicker and easier.